I think this is the oldest built model I still have. 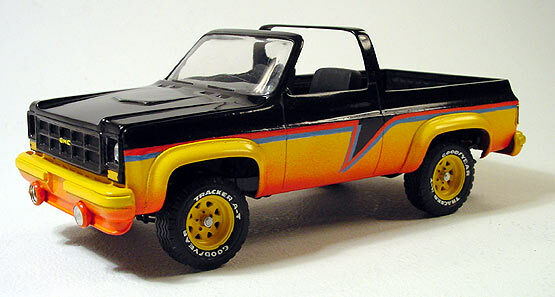 It is based on Monogram's 1977 GMC Jimmy 4x4 kit. It was mostly built out of the box but, I did make a few changes. First, I modified the roof to be a targa top. Then, I gave it a custom paint job. The paint job was inspired by something I saw in Hot Rod magazine. 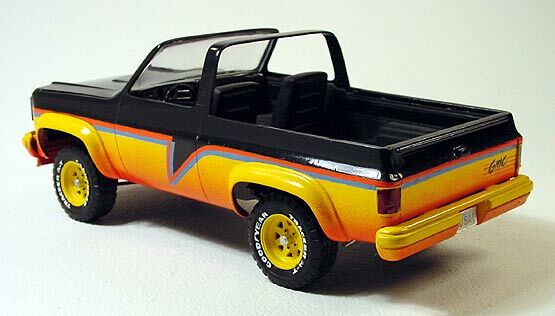 It fades from yellow to orange and was done with Testors spray cans back before I had an airbrush.